Throughout the lifetime of every person there is constant need for solid food to preserve health and prolong life; and, just as such food is necessary to satisfy the requirements of the body, so, too, is there need for water. As is well known, the composition of the body is such that it contains more liquid than solid material, the tissues and the bones weighing much less than the liquid. A tremendous amount of this liquid is continually being lost through the kidneys, through each pore in the skin, and even through every breath that is exhaled, and if continued good health is to be maintained this loss must be constantly made up. This loss is greater in very hot weather or in the performance of strenuous exercise than under ordinary conditions, which accounts for the fact that more than the usual amount of liquid must be supplied during such times. So necessary is liquid refreshment that the body cannot exist without it for any great length of time. In fact, if the supply were cut off so that no more could be obtained, the body would begin to use its own fluids and death would soon occur. A person can live for many days without solid food, but it is not possible to live for more than a very few days without drink. Nature's way of serving notice that the body is in need of liquid refreshment is through the sensation of thirst. Satisfying thirst not only brings relief, but produces a decidedly pleasant sensation; however, the real pleasure of drinking is not experienced until one has become actually thirsty. The various liquids by which thirst may be slaked, or quenched, are known as beverages. The first one of these given to man was water, and it is still the chief beverage, for it is used both alone and as a foundation for numerous other beverages that are calculated to be more tasty, but whose use is liable in some cases to lead to excessive drinking or to the partaking of substances that are injurious to health. The beverages that are in common use may be placed in three general classes: alcoholic, stimulating, and non-stimulating. The alcoholic beverages include such drinks as beer, wine, whiskey, etc., some of which are used more in one country than in another. In fact, almost every class of people known has an alcoholic beverage that has come to be regarded as typical of that class. Alcoholic fermentation is supposed to have been discovered by accident, and when its effect became known it was recognized as a popular means of supplying a beverage and some stimulation besides. Under stimulating beverages come tea, coffee, and cocoa. These are in common use all over the world, certain ones, of course, finding greater favor in some countries than in others. With the exception of cocoa, they provide very little food value. 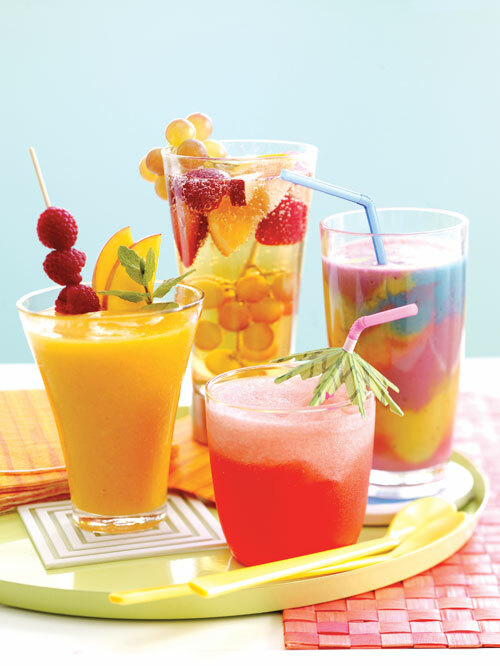 In contrast with these drinks are the non-stimulating beverages, which include fruit punches, soft drinks, and all the milk-and-egg concoctions. These are usually very refreshing, and the majority of them contain sufficient nourishment to recommend their frequent use.